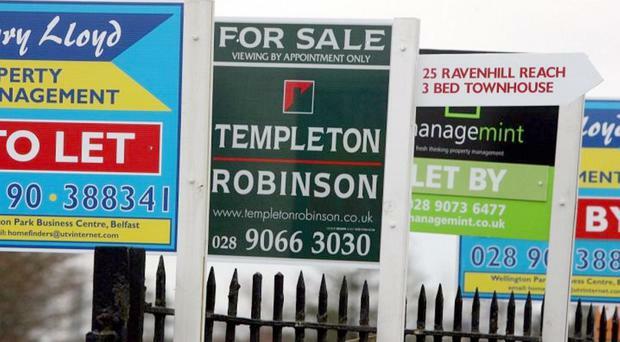 Lending to first-time buyers and home-movers alike is going up in Northern Ireland as activity in the housing market continues to increase. There was a rise of 3.8% in the number of first-time buyers to 2,700 during the third quarter compared to the year before, according to the report from umbrella group UK Finance. The growth in first-time buyers follows the latest house price report from government body Land and Property Services, which recorded a 4.8% year-on-year jump in house prices here to an average of just over £135,000. And the average first-time buyer here is 30, UK Finance said, taking their first step onto the housing ladder on a gross household income of £33,000, whether they are buying alone or with someone else. There were 2,200 new homeowner re-mortgages in Northern Ireland completed in the third quarter, nearly 5% more than in the same quarter a year earlier. The £0.24bn of remortgaging in the third quarter was up 9.1% year-on-year. Derek Wilson, chairman of UK Finance's Northern Ireland Mortgage Committee, said: "The Northern Ireland mortgage market continues to show steady growth in house purchase activity. "Lending to first-time buyers remains the largest sector by value, as borrowers take advantage of what continues to be the most affordable region in the UK. "These figures underline the importance of boosting housing supply to meet this growing demand." "This consistent growth has been reflected in Danske Bank's own figures, which showed a 29% uplift in new to bank mortgage lending across all borrower types in the third quarter when compared with a year ago. "The first-time buyer market continues to demonstrate sustained growth and is the largest sector by value, with activity in the quarter up 3.8% year on year. "The strength of the market is also mirrored in Danske's own figures, with the bank now lending to one in four of all first-time buyers in Northern Ireland. "The competitive deals on offer from many lenders and housebuilders continuing to invest in new housing stock could help explain the sustained growth in the first-time buyer market." And he said that with interest rates expected to go up at some point next year, demand for fixed rate mortgages would rise. "We are seeing more people take out fixed rate mortgages, with increased demand for five-year fixed mortgages rather than shorter two-year deals, which may also be influenced by the current uncertainty around the possible impact of Brexit." By Ryan McAleer A group of residents who lost their High Court battle over a proposed gold mine in Co Tyrone are to take their case to the Court of Appeal. By Staff Reporter Pharmaceutical research firm Fusion Antibodies - one of Northern Ireland's most recent publicly listed companies - has reported revenue growth to £1.5m in the second half of the year.